Here’s a great idea that is spreading, power to the people, from the people. … In a promising experiment in an affluent swath of the borough, dozens of solar-panel arrays spread across rowhouse rooftops are wired into a growing network. 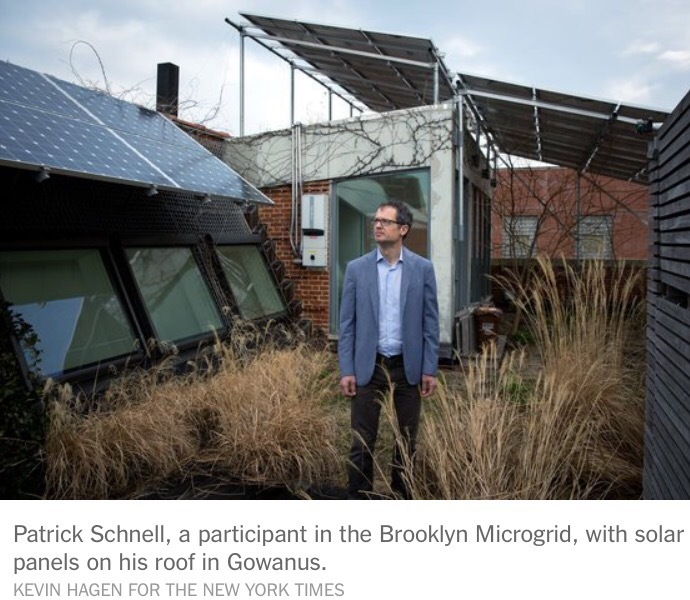 Called the Brooklyn Microgrid, the project is signing up residents and businesses to a virtual trading platform that will allow solar-energy producers to sell excess-electricity credits from their systems to buyers in the group, who may live as close as next door. “Community members can work both individually and collectively to help meet demand in an efficient way,” said Audrey Zibelman, who recently resigned as chairwoman of the New York State Public Service Commission, which regulates the state’s utilities. The project is but one example of how rapidly spreading technologies like rooftop solar and blockchain are upending the traditional relationships between electric companies and consumers, putting ever more control in the hands of customers. Across the globe, upstart companies like LO3 Energy, which is designing the Brooklyn experiment with the industrial giant Siemens, are building digital networks that offer the promise of user-driven, decentralized energy systems that can work in tandem with the traditional large-scale grid or, especially in emerging economies, avoid the need for a grid at all. In Australia, where Ms. Zibelman will soon run the nation’s energy markets, a company called Power Ledger announced the start of a residential electricity trading market based in blockchain last year at a housing development in Perth. In Bangladesh, where an estimated 65 million people lack access to a central grid, ME SOLshare has been developing peer-to-peer trading networks of rural households with and without rooftop solar systems. Producer-consumers there — known as prosumers — can sell excess power into the network, where neighboring homes and businesses can buy it in small increments with a cellphone. And in Germany, Sonnen, a leading supplier of home batteries and smart energy products and services, has created a web of about 8,000 customers, both with and without solar on their roofs, who are trading their stored energy among one another. « Can you solve a chess puzzle that could prove quantum consciousness?